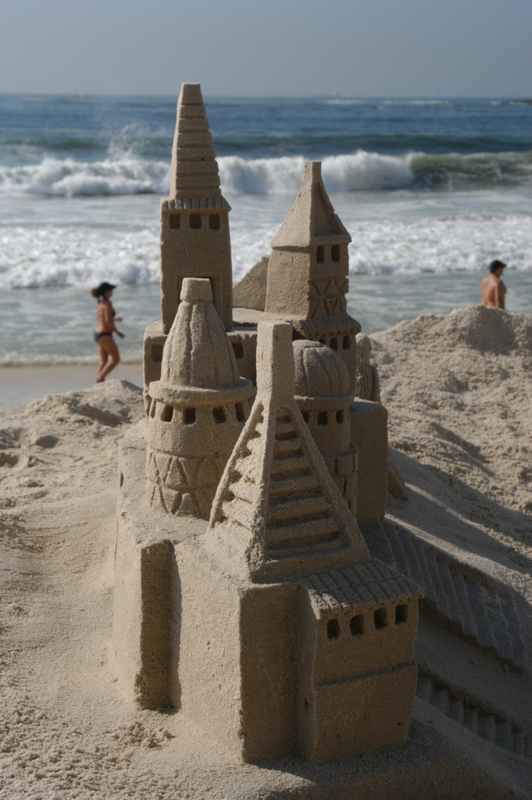 Rogean Rodriguez builds castles in the sand. For eleven years he has squatted on a little piece of shoreline across from the fancy hotels on Rio’s famed Copacabana Beach. On this patch of real estate he creates fantasies by hand with sand and water. His exquisite palaces catch the light and eyes of tourists who walk along the boulevard. Sometimes they contribute a few coins and photograph his masterpieces. At night a watchman guards the kingdom while Rodriguez returns to the hillside “favela” where he lives. On the mountain above Copacabana beach is Pavao. The shanty town that Rodriguez calls home is a short distance yet a world away from his fairy tale castles. “Favelas” are the slums. Created by squatters they are home to many of Rio’s six million residents. It is the Rio that locals steer clear of and tourists are warned to avoid. But these cities within a city are hidden and unique cultures worthy of exploration. With the advent of specially guided tours http://www.favelatour.com.br/ visitors can travel safely into the “favelas” for an eye-opening look at the other Rio de Janeiro. Andres LeJerraga picks me up at the Copacabana Palace, one of the most splendid hotels along its namesake beach. I join a vanload of curious tourists for the ride up to Rocinha, Rio’s most infamous favela. When laying out the itinerary for my visit to Brazil I decided I wanted to personally witness the poverty I had heard so much about. The point of the visit was not to gawk or exploit, but rather to get an authentic view of how people live. I learn that there actually is a name for this kind of tourism. It is called “poorism” and it is a fast growing market taking off in cities like Rio, Bombay, Nairobi and Johannesburg. Part of my interest, I must confess, sprung from a bit of defiance. I grew weary of people telling me how dangerous Rio was. Don’t walk off the main streets, leave any valuables at the hotel, watch out for drug dealers, be careful who you talk to, beware, beware, beware. The huge sprawling Rocinha can be seen on a hillside on the urban outskirts of Rio long before we arrive. Andres tells us as many as 200,000 people live in the slum. A Formula One racetrack went through here before Rocinha started developing in the 1940’s. Today the main drag through Rocinha is Cowboy Lane, a busy commercial center with 1300 shops and three bus lines. Stone and brick houses with tin roofs are precariously packed and stacked one on top of the other on the hillside. They were built by construction workers on solid rock. Many have stunning views. From a rooftop one can see the line of demarkation between the poor and the rich who live in high rise buildings on the other side of the road in an area called Sao Conrado. Because these settlements were created by squatters, refugees and displaced people, infrastructure was an afterthought. Many gather water in big blue tanks on their rooftops. There is a chaotic tangle of cables and wires crisscrossing the roads for electricity. Samba music plays in the streets. From eye level it looks similar to urban business districts in densely populated graffiti covered cities but there is a lot more going on in the “favelas” than what meets the eye. The spontaneous settlements originated when soldiers in the late 1800’s were forced to camp out on the hillsides of large cities. Favelas burst at the seams in the 1900’s as people from the country flocked to the industrialized areas for opportunities. These were the people who built the tourist meccas of Ipanema and Leblon. If you live in a big house in Rio the woman who cares for your children likely lives in a “favela.” If you stay at a hotel on Copacabana Beach, the workers who clean your room and take care of the maintenance likely live in “favelas.” In the past authorities tried to close the favelas down but in the 1990’s the government realized they were here to stay and provided some basic services like garbage pick up, sewage, electricity and water. Now there are about 750 “favelas” in Rio. It’s estimated that up to one third of people in the city live in them. 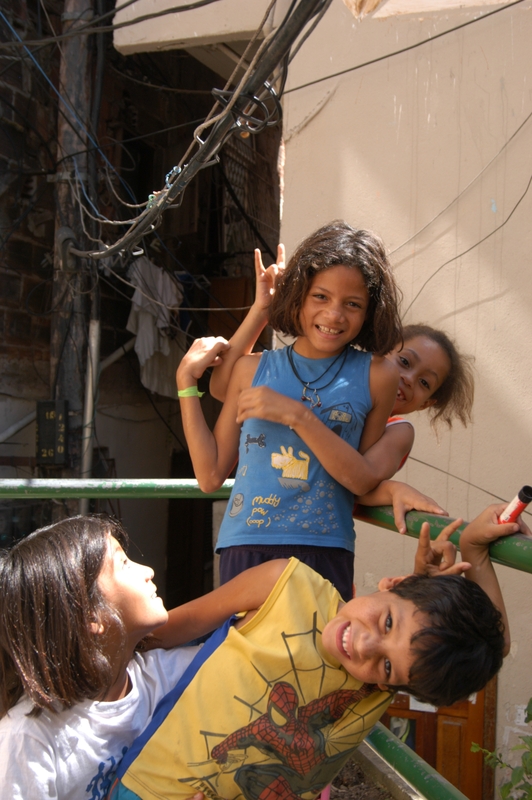 Brazil is one of the most economically unequal countries in the world with 34% of people living in poverty. Because of this the population of “favelas” is growing much faster than that of the surrounding areas. Many “favelas” are well known as havens of drug dealing and gang warfare. Indeed drug lords are alive and well in the back alleyways of the settlements. Police patrol the outskirts where marijuana and cocaine are bought and sold to the middle class. Experience has taught them not to go inside. When they do the confrontations are often extremely violent. The criminal element is both protected and secluded by the “favelas.” Police are gunning for the drug lords and they don’t stand a chance outside the borders. 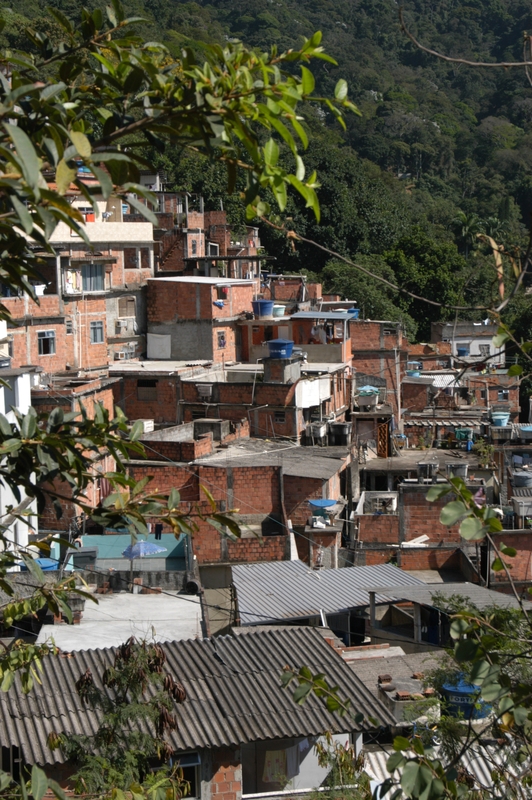 Inside the “favelas” the traffickers are safe and strong. The drug lords keep order in the favelas and in a strange code of morality they ban all stealing and prostitution. If outsiders feel unsafe in the favelas they won’t come to buy drugs. At one point, Andres tells us to put away our cameras. He doesn’t want us to accidentally photograph a drug deal going down. He also tells us to watch for kites flying. Kites can be harbingers of drug activity. When a green kite flies, marijuana is arriving. A white kite tells of cocaine, a red kite means the cops are closing in. But to characterize “favelas” as simply dens of iniquity is to miss the point. In reality less than 1% of the residents of the favelas are involved in drug trafficking. Most of the people who live in Rocinha and other “favelas” are hard working blue collar laborers who get by on less than $300 a month. The first school of Samba was born in Rocinha and many of the Samba schools that entertain during Carnaval come from the “favelas.” The artisans along Cowboy Lane with their colorful paintings of Rio’s famous views, purses made of beer tabs and beautiful embroidery hint at the talent that resides here. For tourists who venture into the “favelas” this is the first impression. Some criticize the “favela” tours and say they are voyeuristic and insensitive. I would argue the opportunity to interact with the residents in the “favelas,” witness their entrepreneurial spirit and be illuminated with political, cultural and social context changes you. By ignoring poverty it does not go away. In our small group we were able to ask questions of Andres who lives in a favela called Tarejada himself, see young favelados play and get out on foot and explore. At Vila Caonoas, a small favela of about 2000 people that translates into “road of the canoes” we get an intimate view of how people live. Walking through the alleyways we are able to smell omelets cooking, listen to the samba pouring from the cramped houses and see mothers and children through windows and doorways. There is no privacy here but there are generations of family and tradition. We are greeted warmly and are also able to witness the good work being done by organizations like the Rotary Club to make sure children are educated and offered health care. Before we leave we have the chance to give back to the community by purchasing crafts. I have witnessed poverty in other countries and by not turning away I believe it adds to our compassion and humanity. Seeing how people live motivates us to action. Visiting the “favelas” enabled me to look beyond the beach and its beautiful people. Seeing the “favelas” with my own eyes gave me a much more complete picture of Rio de Janeiro and dispelled my fears. The journey made me appreciate the struggle people face in a city where there is a line in the sand between the haves and the have nots. Mostly, it made me want to stop and talk to Rogean Rodriguez about the “favela” of Pavao on the hill above Copacabana Beach and his dreams someday of a future for himself and his family that is just as magnificent as his castles in the sand. Categories: Global Poverty, Travel | Tags: brazil, favelas, Global Poverty, rio de janeiro, tourism | Permalink. I have been living in Rio for a year, now I am back in Europe. If you like my short films you can feature them and write something about it. I like your writing style! I will do that and thanks again. Vichy, thanks for your attention and kindness to inform about your article. Andres died in Rio, last march, natual causes. Your article helps to perpetrate his image and work. Very nice article about Rocinha, my home..I am glad to see you had a good experence there.